Dual Cam Arm - This hitch uses a damping mechanism that uses a “return to straight“ force derived from a cam system. 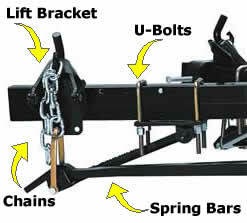 This damping mechanism depends upon spring bar loading and there are reports that much better handling is achieved when the spring bar load ratings are closely matched to the actual hitch weight. This type of sway control starts to control sway before it happens rather than once it has already occurred. Main Body Assembly - The section of the friction sway control unit that houses the actual sway controls. Sway - Trailer sway is caused by many factors, but the main cause is wind gusts (crosswinds) and sudden changes in direction of the towing vehicle. It can also be caused by passing traffic, improper loading, overloading, poor tire inflation and incorrect weight distribution. Slide Bar - This is the adjustment area of the friction sway control. Data generated in 0.001318 (s) from 6 queries.